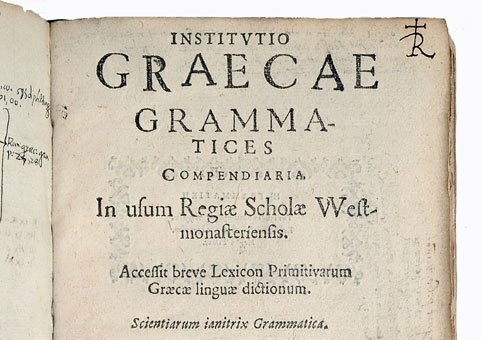 With support from the Mellon Digital Humanities Fund and the Roberts Fund for Classical Studies at Dickinson, we have completed a new digital version of that perennially useful tool, Allen and Greenough’s New Latin Grammar for Schools and Colleges, edited by J.B. Greenough, G.L. Kitteredge, A.A. Howard, and Benjamin L. D’Ooge. Boston: Ginn & Company, 1903. The project involved re-scanning the book to have good quality page images, then editing a set of existing XML files kindly provided by the Perseus Project. 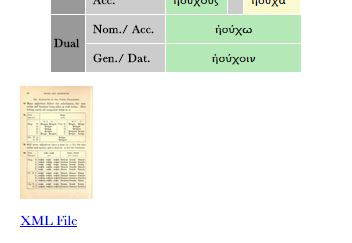 We added to that the newly digitized index, which was not in the Perseus XML. The purpose there was to make the book browsable via the index, which is important for user utility, and absent in all other online versions. On March 23, 2014, Kaylin Bednarz (Dickinson ’15) finished revision of XML files for Allen & Grenough, and the creation of html files based on the new XML. She was assisted and trained in the use of Oxygen software (which converts the XML into web-ready html) by Matthew Kochis, Postdoctoral Fellow in Digital Humanities, who also helped with day to day project management. In late March, Dickinson web developer Ryan Burke uploaded the html and XML files to Dickinson servers, and created the web interface for A&G in html. 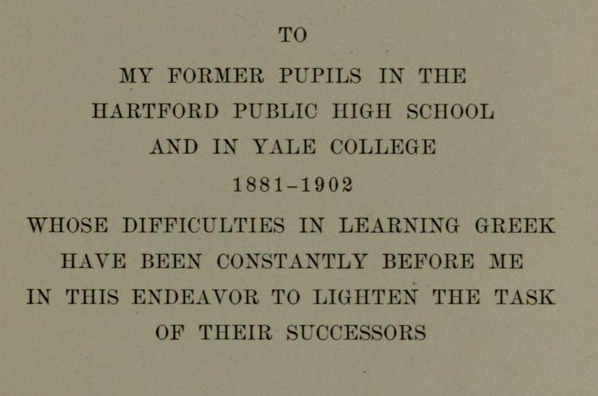 This revealed issues of formatting: indentations were often not preserved, resulting in lack of clarity. Some character formatting was not right, and footnotes from the original print resource were not clearly displayed. Forward and back buttons had to be put in for each of the 638 sections. 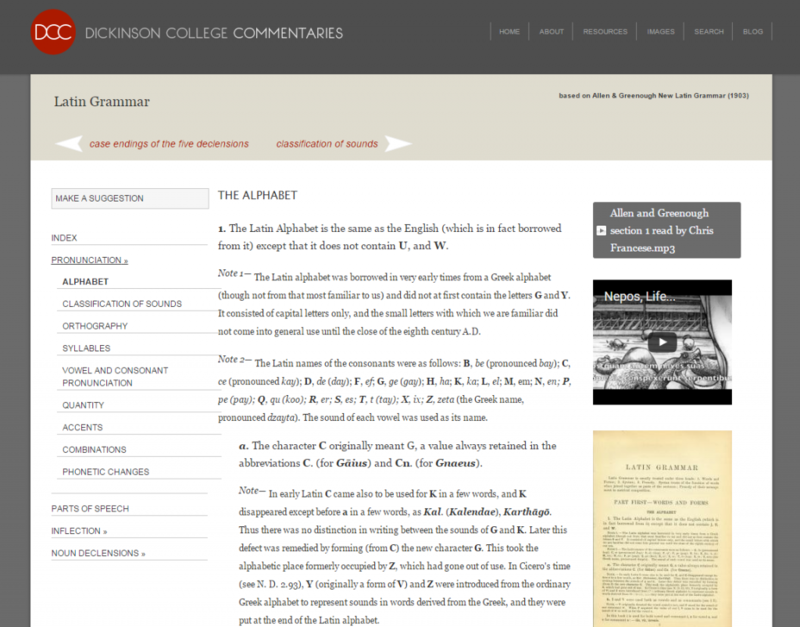 On May 20, 2014, Meagan Ayer (PhD in classics and ancient history, University of Buffalo, 2013) began work hand-editing Allen & Greenough html files, removing errors and fixing formatting, adding navigational infrastructure using Adobe Dreamweaver. A few missing XML files had to be added and converted to html, and those finishing touches were put on last week. 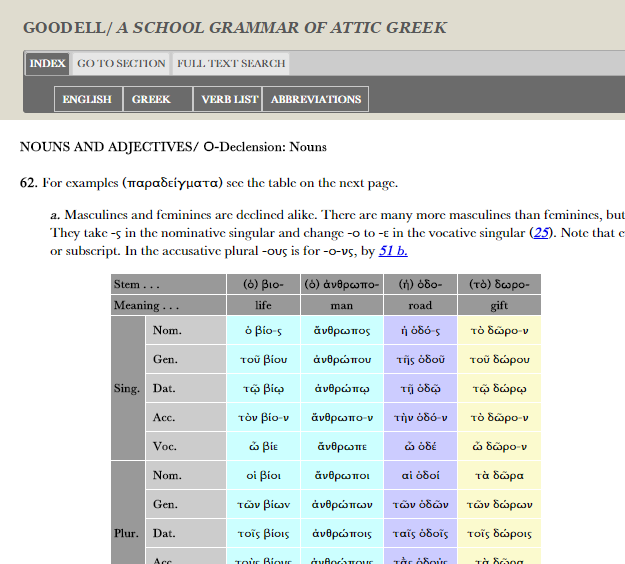 Thomas Dwight Goodell, A School Grammar of Attic Greek (New York: D. Appleton and Co., 1902). This excellent work was scanned by the Internet Archive. Last year Bruce Robertson of Mont Allison University kindly performed the OCR using Rigaudon, the output of which is available on Lace. 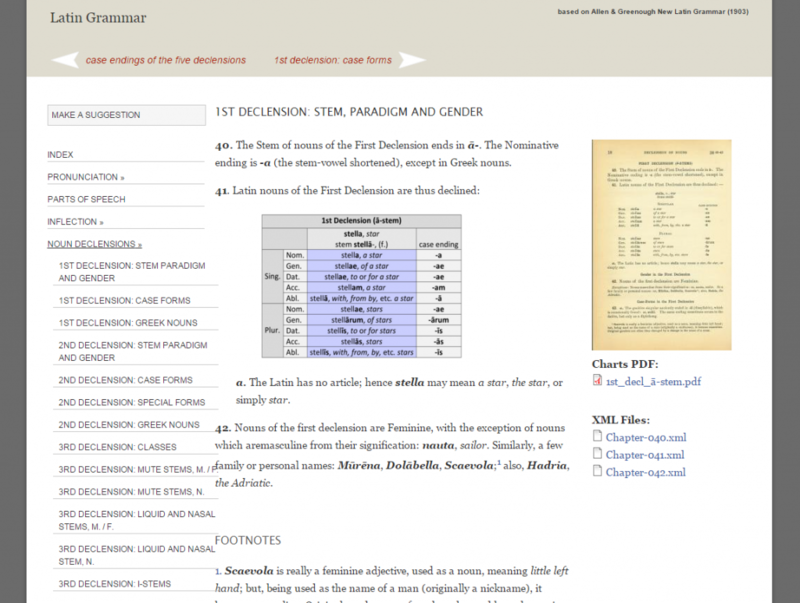 At Dickinson the OCR output was edited and the XML and html pages created by Christina Errico. Ryan Burke has created the web interface. Meagan Ayer is in the process of editing and correcting the html pages. So look for that in the next few months!